The SIU field school will return to the Ft. Kaskaskia and Miller Grove sites this coming summer (2019). At Ft. Kaskaskia last year we unexpectedly discovered there were TWO Ft. Kaskaskias, a French colonial (1759-1765) fort and the remains of an American (1802-1807) fort visited by Lewis and Clark in 1803 located 300 m to the north. The existence of the American fort had been unknown before last year's field school. The Miller Grove site consists of the remains of over 20 farmsteads established by freed African-Americans in the 1840s. Last year we worked at the Abby Miller farmstead, this year we are hoping to work at the Riley Williams farmstead where Forest Service investigations about 10 years ago recovered three lead printer's type. The possible existence of a printing press within the community had been previously unknown and raises the question of what the Miller Grove people were printing that had to be kept secret. Forged freedom papers? Abolitionist literature? We simply do not know at this time. 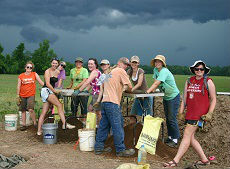 Anthropology 496: Archaeology Field School has been taught since 1970. We encourage our own majors to take this class, and we welcome both students in related majors at SIU Carbondale and students from other institutions. The instructional staff comprises one full-time faculty member or senior doctoral student and two graduate teaching assistants. 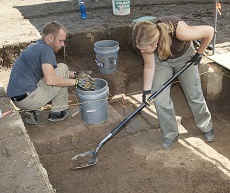 The Archaeology Field School offers full-time instruction in archaeological field methods with a special emphasis on basic excavation and laboratory techniques. Students are selected to participate in the program based on their previous coursework and fieldwork and general interest in archaeology. Why take a course in archaeological field techniques? Job opportunities - field school + a degree in anthropology or a related field = employability as an archaeologist straight out of college! Earn 6 400-level credits with NO on-campus fees - it is really inexpensive. Out-of-state students pay in-state tuition rates. No exams / No required readings. You get to play in the dirt all day! Get a great tan and a great workout. Archaeology is fun fun fun!!! 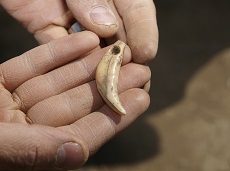 There are no specific prerequisites, but an introductory course in anthropology is recommended, and additional coursework in archaeology is helpful prior to taking the field school. Permission of the Department of Anthropology is required to register, which is attained by completing and submitting the Application Form. Estimated costs of the 2019 field school course are listed below. We do not expect additional increases, but this web page will be updated immediately should they occur. The cost of mandatory medical insurance has NOT been included in these figures. *Tuition shown is the current rate for 6 credit hours, at the undergraduate off-campus rate, which is the same for Illinois residents and non-residents. Existing SIU Carbondale students may pay a lower tuition depending on the year they enrolled here. **The total basic costs estimate does NOT include the price of mandatory medical insurance (we don’t care how you get it but require you to have it), personal items students may bring, meals, or lodging. The SIU Carbondale field school welcomes students from other colleges and universities. The tuition and other costs are the same as for existing SIU Carbondale students. To register for our course a non-SIU Carbondale student must be admitted to SIU Carbondale for the summer term. Undergraduates: Please print and fill out this application form, then mail it to Dr. Mark Wagner at the address shown below. Parts that do not need to be filled out have been covered in gray rectangles, and a few entries have been pre-filled to ensure correct processing. There is a $40.00 application fee. Along with the application you will need to send a copy of your transcript (a photocopy of your transcript will be ok, it does not need to be an original). Graduates: If you wish to transfer the credit hours back to your graduate program you should fill out this form and mail it to Dr. Mark Wagner at the address shown below. You will be billed for graduate tuition, which is roughly 30% higher than the amount shown above. If you do not wish to transfer the credit hours, you can apply as an "undergraduate" and pay the undergrad tuition rate shown above. To apply for a spot in the field school please fill out and send us, by May 1, the Archaeology Field School Application (this form is for departmental use; it is distinct from the SIU Carbondale application form described above that non-SIU Carbondale students must fill out). If you are not an anthropology major at SIU Carbondale, you will need to have a Faculty member e-mail or mail a brief letter of reference to Dr. Mark Wagner (address below). We can also answer any additional questions.